Robert Dutton Artist: Finally finished! Pip Seymour and Unison Colour Pastels on Canson Mi-Teintes 'Touch' 350gsm pastel paper (black). Another pastel completed and ready for my exhibition soon in Richmond - fantastic! It's always a great feeling to complete a painting, especially one so admired as this one was when I started it as a demonstration a little earlier in the year at 'Ilkley Art Show' sponsored by 'The Ilkley Art Shop' in Ilkley, West Yorkshire. The two day prestigious art event was as popular as ever this year and with director and exhibition organiser Tim Tennant (owner of The Ilkley Art shop) taking the reigns it was no surprise it was so good as he is highly respected in the art trade known for putting on such a great show at the 'Kings Hall and winter Gardens' right in the centre of Ilkley. The two day Summer event in late August is one that many different artists throughout the region (and afar) really look forward too. Big brand names turn up to display some fantastic art products for artists of all levels of ability to see, trail and buy at fab prices. 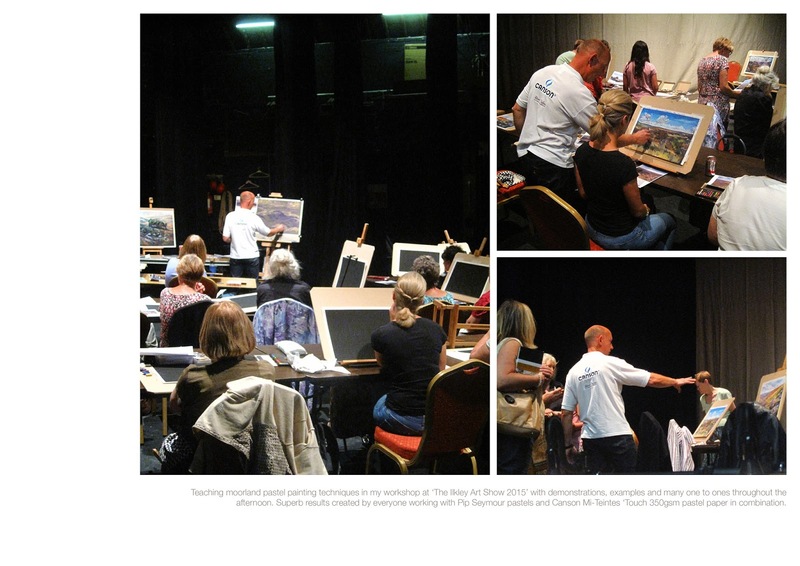 This year I had the pleasure to represent Canson (being a UK Canson Ambassador) at the prestigious art event at their stand and on also on stage with my workshop (over subscribed which was absolutely fabulous) being supported by Pip Seymour with their lovely pastels all students enjoyed painting with. Naturally with the famous Ilkley Moor being right behind the 'Kings Hall and Winter Gardens' the workshop everyone enjoyed immensely had a moorland theme. the work everyone created in the afternoon from 1-3.30pm were fantastic. A testament to how quickly and effectively pastels can be to paint with given a nudge or two in the right direction of course! I'm looking forward to next year already and judging by the students who came to paint with me, they are too with several rebooking already! Brilliant news!